Have you seen the new artwork? Deputy Mayor Cr Sonya Mezinec, City of Mount Gambier Arts and Culture Development Officer Serena Wong, Artist/Designer Kristyn Jones and Herbert Commercial Real Estate Agent Matt Kain in front of the newly installed public art. 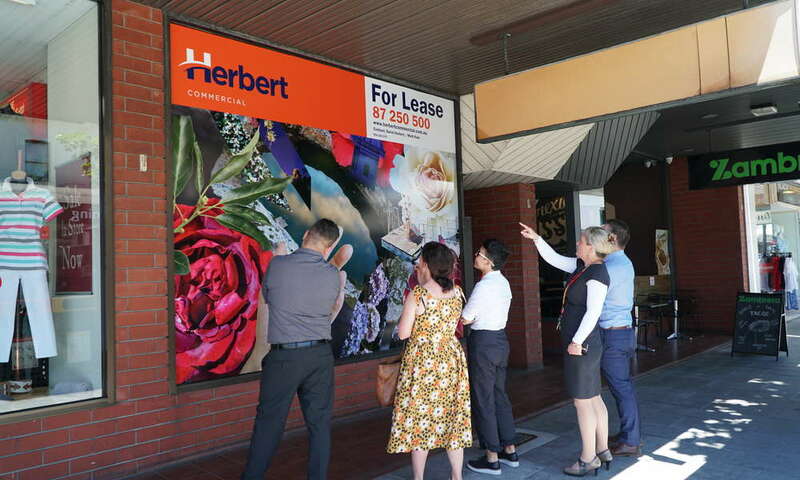 Commercial Street West is home to a new trial public art initiative to create interest in vacant shopfronts and increase foot traffic in the CBD. City of Mount Gambier and Commercial Real Estate Agent Matt Kain identified a pilot site to feature a locally inspired design by artist/designer Kristyn Jones. Located at 3b Commercial Street West the locally inspired artistic design was installed today and aimsto create conversation, an appreciation for our natural environment and to build civic pride in our city and region while highlighting the commercial opportunities available in the heart of Mount Gambier. The brief was to produce three designs that present Mount Gambier and the surrounding region in a format that is unique and will create interest. Kristyn Jones has created designs to meet the brief using a selection of photographer Ockert Le Roux’s work and her own photography. The landlord has been a willing participant in the public art initiative and understands that creating interest and increasing value in the CBD precinct is a collaborative process. "The owner of this property is very happy to see the energy invested into both the property and the marketing for a new tennant," Herbert Commercial Real Estate Agent Matt Kain said. "This installation is part of our overall strategy to refresh the entire group of landowners properties and surrounding businesses and this is just one of many properties that requires this approach."